alaTest zebrał i przeanalizował 389 opinii użytkowników z magazynów i stron. Oceniającym podoba się rozmiar i jakość obrazu. Cena jest również bardzo dobra. Oceniający mają wątpliwości co do zestawu złącz. Eksperci oceniają ten produkt na 72/100 a użytkownicy na 86/100. Przeanalizowaliśmy te oceny, wiek produktu i inne czynniki. W porównaniu do innych produktów z kategorii Kamery wideo, Sony HDR CX130 uzyskał ogólny alaScore™ 89/100 = jakość Bardzo dobra. A wide-angle lens, built-in USB cable, and consistently good automated behavior highlight the otherwise no-frills Sony Handycam HDR-CX130 , CX160 , and XR160 camcorders. The sub-HD resolution sensor on these camcorders produces merely satisfactory video. Typical for their price class, the no-frills Sony Handycam HDR-CX130, CX160, and XR160 produce generally subpar HD video, but if you're not picky you'll probably be fine. The CX130 is the best buy of the three, as long as you go cheap on the memory card. The CX130 is an impressive camcorder within its price range, featuring a stylish exterior and large LCD screen, though its image and video quality don't quite live up to the aesthetics. A wide-angle lens, built-in USB cable, and consistently good automated behavior highlight the otherwise no-frills ; , ; , and ; camcorders. The all new Sony Handycam HDR-CX130 is one of the no frills model of this entry level series and has created quite a buzz in the market. 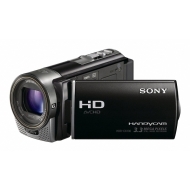 Der Sony HDR-CX130E ist ein HD-Camcorder mit Speicherkarte (ein Steck­platz). Klassische läng­liche Bauform (horizon­taler Camcorder). Günstig. Liefert passable Videos (Note: 2,7). Gut bei Tages­licht. Bild­stabilisierung nur mäßig. Sehr guter Auto­fokus. Der Sony HDR-CX130 ist ein leichter und handlicher Camcorder, der mit vielen bedienfreundlichen und intelligenten Funktionen ausgestattet ist. Der Sony HDR-CX130 prädestiniert sich besonders für die Einsteiger.